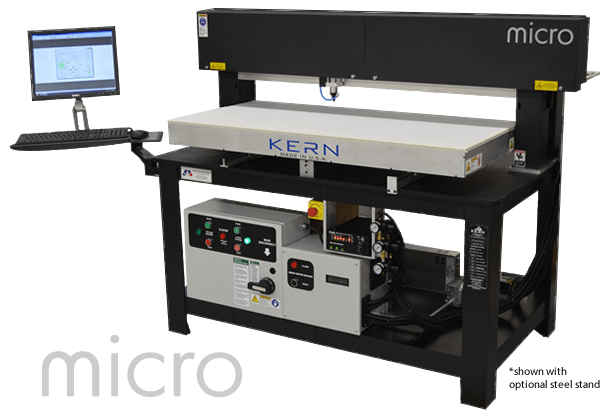 TEAM’s Kern micro 24 laser system can be used for high precision cutting and engraving in a variety of substrates; Available materials include plastics (Acrylic, Delrin, being the most common), metals (Steel and Stainless Steel being the most common), wood, and foam (where compatible). See the full list of compatible materials below. Laser cutting is a CNC (computer numerical control) driven process by which material is removed via a focused laser beam. The machine has two operation modes: Thru-Cutting, AKA Vector Cutting (where file input = vector file), or Engraving, AKA Raster Engraving (where file input = grayscale graphic). The laser cutter present in the TEAM lab is a 190W CO2 laser cutter, capable of processing metals and plastics at very high prevision, very rapidly (processing time can be as few as several minutes). Generally, components derived from laser cutting are flat, with features limited to a single plane (cutting axis). It is common to fix multiple laser cut parts into assemblies by way of interlocking, or stacking features. Bends can also be introduced to many materials to increase complexity of the part/assembly. By far, the most frequently used materials are: Stainless Steel, Acrylic, Delrin, and King Starboard. Below, is a complete listing of all the materials the TEAM lab can process. Consult with the TEAM lab manager for appropriate thickness where dimensions are lacking, or if you need thicker materials cut. Woods (MDF, balsa, birch, poplar, red oak, cherry, holly, etc.) – we stock various thicknesses of birch plywood. Glass – we can engrave glass, but we generally cannot cut it. As the laser cutter excels at cutting flat-stock of finite thickness, special consideration must be made when designing for the laser cutter; It’s generally true that your material thickness is a fixed constraint, dependent on what material thickness can be sourced. Further, most all features will be “through” the entire part; partial depth features must (usually) be added through a secondary post-process (hand-finishing, milling being two examples). Finger joints are the basic joint for putting two flat plates together at a perpendicular angle to make a corner. It basically consists of tabs on the mated sides that interlock. The tabs are usually as long as the material is thick to make a nice, clean seam. Mortise and tenon joints are very similar to finger joints, except the “fingers” on one piece of material stick through holes in the other piece of material. These are useful for creating “T” like structures and easily mounting internal support beams for more complicated laser cut structures. Slot joints are another pretty common type of simple laser cut joint. The two connecting pieces each have slots cut halfway through them, which can slide into each other to form “X” like structures out of the laser cut material. Dovetail joints and jigsaw joints are usually used in laser cutting to mount two materials flush to one another, with even top and bottom surfaces. Although these are more widely used in woodworking, they can come in handy if you’re looking for a certain effect. The above joints will work just fine when the fit is designed to create slight interference (and occasionally with adhesives), but there are instances where removable fasteners are preferred in your designs. By creating a hole for a bolt to slide through and a slot for a nut to be press fit into, you can secure the joints of laser cut parts easily. Also consider, rotating features can be added by way of dowel pins pressed into stock, to create pivot points. Note: Our laser cutter possess the ability to process “offsets” to compensate for laser cutting width, or fine-tune fit of components on-site.